The fight to be the best executive holdall just got fiercer with the arrival of the new Mercedes-Benz E-Class Estate and Volvo V90. 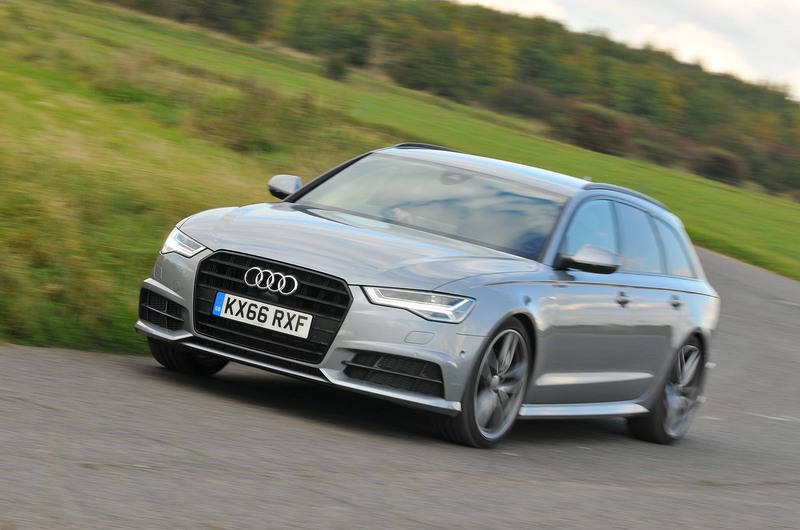 Can Audi’s A6 Avant keep them at bay? This is how interesting Volvo is at the minute. Everyone involved in this test, bar me, has been calling it the ‘Volvo V90 triple test’. It’s really not, you know. The V90 has been available for, ooh, months. 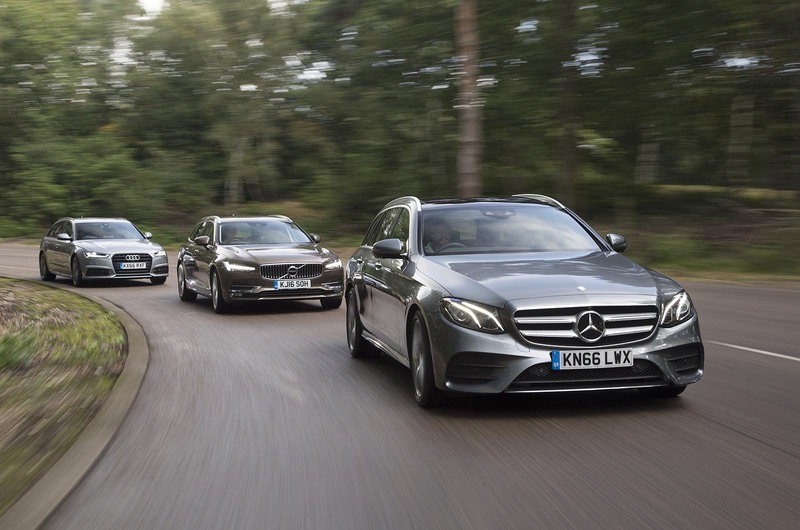 The freshest car here – even if going on sale a couple of months after the V90 makes it the equivalent of a second-born twin in car age terms – is the new Mercedes-Benz E-Class Estate. But although the E-Class Estate is why we’re here today, there’s just something reassuringly familiar about an E-Class wagon, isn’t there? It’s a constant, as reassuringly ever-present as your garden fence. The V90, though. Ah, well, that’s something else. Of course, there is always a big Volvo estate, but rarely has one been such an integral and noticeable part of its company’s resurgence. Not since the 850, in fact – that boxy, five-cylinder, BTCC-dwelling, ‘Shock: a Volvo that’s great to drive’ cover-story car – has there been such a hubbub (some call it a kerfuffle, some a brouhaha) about a big Swedish wagon. So, go on, that’s where we’ll begin. 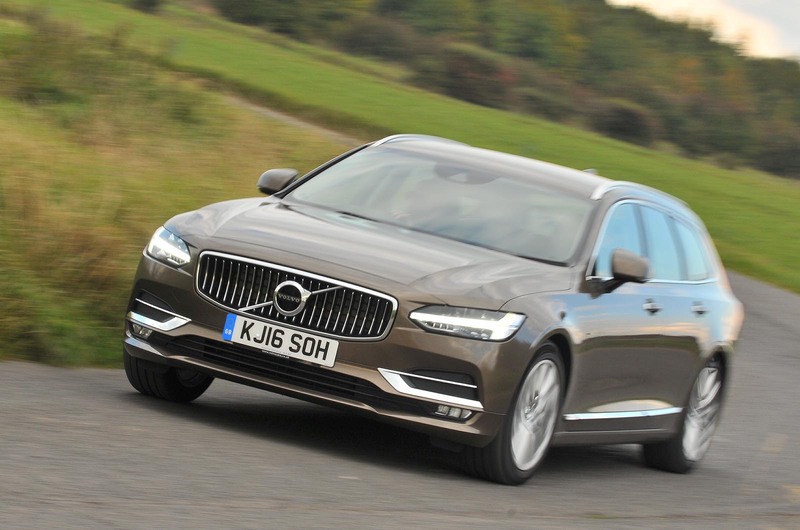 The S90 saloon/V90 estate is the second model to arrive under Volvo’s big Chinese-backed plan to sell more cars. It’s based on the same basic architecture as last year’s XC90, a car we like a lot, but is unencumbered by the necessity to have a tall 4x4’s body, and with another year’s development under its belt, it ought to be even better. It arrives here with a 187bhp 2.0-litre four-cylinder diesel engine (all Volvos are 2.0-litre fours these days), driving the front wheels through an eight-speed automatic gearbox and called the D4. In midrange Inscription trim, it’s £37,555, before options. This one is modestly specced up to £40,730. Then there’s the E-Class. Its range is bigger and more complicated, with SEs for comfort and AMG Lines for ‘greater sporty feel’, or something, and this is the latter. There are V6s but this is an E220d, which has a 2.0-litre diesel making 191bhp. It’s longitudinally mounted but unique in this company in that it drives the rear wheels, and via a nine-speed automatic gearbox. The list price is £40,430, which is on the nose of the Volvo, but its optional equipment takes the price to £50,895. Unfair? Well, when we make the call to see if we can test something appropriate for a few days, we don’t get the full run of an online configurator as you might if you were speccing one to run yourself. Or maybe you don’t, either. Some options will add a bit of pizzazz here or there, but the short of it is that all three of these cars are technically comparable and that the market for big executive wagons is as fiercely competitive as any other. You’ll find one and it’ll be pretty close mechanically and in its spec to another, within your or your fleet manager’s budget. Third up, then, is the estate that has been on sale for the longest: Audi’s A6 Avant. It, too, has a 2.0-litre four-cylinder diesel, also longitudinal but driving the front wheels through a seven-speed dual-clutch automatic gearbox. 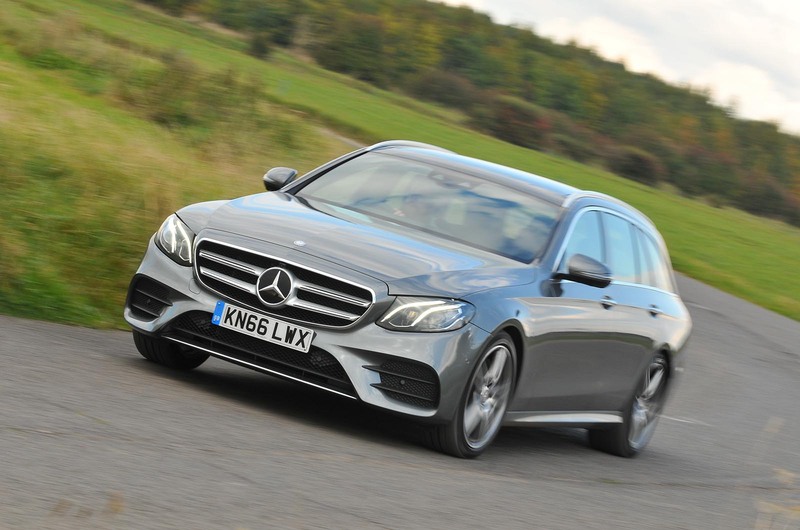 It makes 187bhp and in this Black Edition – which, like an AMG Line, brings sportier trim, although ‘sporty’ is a relative term in 1800kg estate territory – costs £40,915. As standard, the Black Edition has 20in alloy wheels, whose effect on ride quality Audi has presumably attempted to mitigate by fitting this one with £2000 of air suspension. The E-Class gets air springs at the rear as standard but coils on the front. This Volvo has coil springs on the front and a composite leaf spring on the rear, but if you wanted air, it would cost you £950 at the front or £1500 allround. Right? Right. In short, then: three big estates, all within a few quid a month of each other and all within 13mm in length of each other, at a smidgen below five metres long. And, well, I don’t know about you, but there’s always something very appealing about a big wagon, I find. So much more so than a saloon, even a luxury one from the class above. Much more useful, much better looking, much less ‘airport taxi’. In fact, swing from a current-generation Mercedes-Benz S-Class and into this E220d and you’ll not think that you’ve stepped down a class in quality at all. The lavish dashboard and its four big, round central air vents are a bit steampunk, a bit nautical. Mostly, though, it feels so classy because the E-Class gets Mercedes’ latest-generation infotainment, lined up front and centre. The dials are digital and the central screen is bigger than my telly, so much so that a full-screen sat-nav is just too distracting. There are brilliant little swipe-sensitive control nodules on each steering wheel stalk. On the centre of the transmission tunnel sits the main rotary controller and, well, all of this infotainment malarkey is a bit like Apple versus Samsung versus Sony: if you get used to one system, you tend to swear by it. But the latest-generation Mercedes system is a gem and it sits within a cabin that’s extremely high on fit and finish. But no more so than the V90, which, like the XC90, has a lovely interior. That portrait touchscreen, though, eh? All 9.0in of it. I thought it was the best thing in the world last year, but that was before this 12.3in thing turned up on the Mercedes (albeit for an extra £1495). I’m starting to think that a rotary dial with touch-sensitive pad is easier to use on the move than a touchscreen, too, but still, the Volvo is terrific inside. It feels as exquisitely put together as any car in the class and it’s so light, so airy. You might think that’s because its window line is lower than in the other two, specifically the Audi, which has the most austere, dark cabin, but a back-to-back sampling of the two driving positions suggests it ain’t so. It’s simply that the Volvo’s material and colour choices, not just on leather but across the whole trim, and buttons and all, is more vibrant, lively and relaxed. The V90 feels like my kitchen, the A6 Avant like my hi-fi. And I’d rather live in my kitchen than my stereo. Not that there’s anything wrong with the way the Audi feels put together. Its infotainment is easy to use, if less savvy, due to the age of the car (a new model is two years away) and there are analogue dials. Guess what: unlike the other two, you can’t change the appearance of them and it doesn’t matter a jot. They’re the clearest of the trio, and I don’t know about you but that’s pretty much all I want from a speedometer. Each of these cars has an excellent driving position. You could say the Volvo’s seats are the flattest or the Mercedes makes the best space of its transmission tunnel because the gear selector is on a column stalk rather than being a big, clunky stick occupying valuable cup space. But then I’d rather the wipers and indicators didn’t share the same stalk. Swings, roundabouts, details: all are comfortable. In every case, you can tell that this is where they spend the time and care. The premium German brands stick their biggest, baddest new technology on their flagship luxury saloons, but the nub of it is that this is where the money is, where the volume is and where the really hard buyer decisions are made. So they don’t take risks. They look at every detail of every rival and they nail it precisely. In terms of impressiveness inside, then, the order goes Mercedes, Volvo, Audi. In terms of appeal, I’d swap the first two. All three have boots. Of course they have boots, with power-operated tailgates as standard or by option, but pointlessly either way. Volvo makes no pretence about who won the argument over space or style: the designer did, and the V90’s sloping roof means the luggage volume is 560 litres with the seats up, rising to 1526 with them down. The Audi does a little better with the seats in place, at 565 litres, and 1680 with them down, but the E-Class is, at 670-1820 litres, the car in which to move your offspring to university. I can’t really imagine a time when I’d fill a V90 to bursting, but if you could, the E-Class is the way to turn. The E-Class’s extra capacity doesn’t mean there’s less rear accommodation, either. At 5ft 10in, I get more than a hand’s width of head and knee room behind my own driving position in any of them, but the A6 feels the most claustrophic and the Mercedes has the cheapestfeeling materials in the back, so the Volvo has the choice rear bench. Except that in the Volvo, you’re not party to the best ride comfort. There’s nothing wrong with it, per se. In fact, there’s a contented, slightly loping ride quality that feels like a big Volvo estate in the grandest tradition, and when the chassis is loaded up in a corner or under braking, it deals with the extra inputs pretty well. It’s on 18in wheels and relatively generous 245/45-profile tyres, which, I’m sure, is a help. But there’s a little knobbliness over some surfaces that pushes through into the cabin and sometimes into the steering, which is otherwise beautifully smooth, with just the right amount of self-centring, and not overly slow, even at three turns lock to lock. Dynamically, the V90 has the measure of the Audi, whose air suspension can’t overcome the brittleness, partly, presumably, caused by the 255/35 tyres and partly because Audi is generally happy to sacrifice some comfort to retain better body control. The A6’s body movements are more tied down than the Volvo’s, but it feels no more agile. Its steering is far less satisfying, too. It’s quick enough, at 2.8 turns, and alert and responsive in the first part of the turn, but there’s no consistency to the feel or weighting. Sometimes it’s overly light and doesn’t pull back to the centre enough; at other times it feels heavier while giving you no particular reason for being that way. Still, how important is the steering in a big estate? Important enough: it’s the thing you use all the time, after all, as much so as the engine. In which area, the Audi bests the Volvo hands down. In isolation, the V90’s unit is fine. The D4 lacks the compressed-air-assisted step-off of the more powerful D5 engine, but response is good anyway and it easily settles to a 1750rpm-at-70mph cruise, where wind and road noise are both restrained. But the Audi’s motor is quieter, and more responsive more often, to the extent that you just notice it less, which is above all the telling thing in a car like this. Then there’s the E-Class. Mercedes says it has quietened the E220d’s engine since the saloon’s launch, and although I think it’s a touch more audible than the Audi’s unit at idle, unlike the V90’s, you barely hear it once you’re under way. It feels no faster than the other two. Its 7.7sec rather than 8.5sec 0-62mph time you can most likely attribute to its rear-drive layout, and combined with quick, 2.4-turns-betweenlock steering and a sense of agility and purity that’s missing from the driving experience of the other pair, the E-Class is the most satisfying to drive. It’s not the least comfortable, either, despite the AMG Line set-up and its 245/40 R19 tyres. There’s quick initial lean but body control is good after that, and the general ride is composed and settled – as absorbent as the Volvo but as controlled as the Audi. That seals the Mercedes a win by a clear head, then – especially from an Autocar point of view, written for people like you, who like driving. No shame that the Audi – still a fine car – sits in third place only two years before it will be replaced. But the margins are tight between all three, and if you like just sitting in a nice place – and who doesn’t? – then the Volvo will suit you as well as any car on earth. Nobody whose decision making abilities lead them to spend the outrageous price of one of these tedious barges should be let anywhere near an 'exective' position. You just sound like a jealous, bitter and twisted individual. I'm so sorry life turned out like this for you. Agreed. These are stupid money for TWO LITRE FOUR CYLINDER DIESELS. I wouldn't touch any of them at half the price. Yuck. As soon as your start measuring quality and value by cylinders and displacement you expose your ignorance about all things car. Projecting much are we Chris? Projecting much are we Chris? Someone sounds very insecure. I don think anyone who judges other people by what car they buy should be let anywhere near any decision making.FWIW these are great if you need a big estate but want something classy and less cardboard box than an octavia/superb. Yep, they're expensive, but once they're 5 years old they'll be briliant used buys and a third of the price. Although you do pre-qualify that you don't get access to a choice of test vehicles, even so, any dynamic comments here are really pointless space filling as the car you do have are so considerably different. When is Autocar going to start executing these chinky spammers? Hopefully when they start executing the racists. as A6 and V90 lose a road test against a vehicle that is 25% more expensive, but only just, and reading the article, it seems the V90 is better in a fair amount of the categories tested, but still didnt win. But as the article says, its written by people who like driving, perhaps you need to revisit some of the other tests where other German marques win, not because they are better to drive, but because they have squashier/softer dashboards..